Prompt: The meta for this puzzle is a song from the ’70s. Grid with a lot in the 6-7-8-9 range but nothing longer, so no overt theme. But there are five circled letters in the grid, so let’s start there. 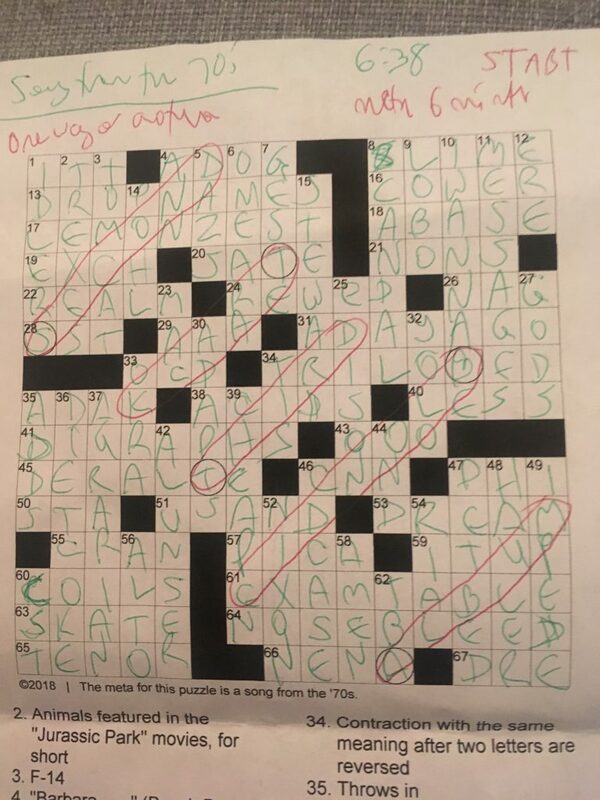 Prompted by the “turn” in the title, one of the first things I looked for was whether any of those circled squares began diagonal entries, and lo and behold they do. There are five parallel diags heading SW to NE — or are they? Closer inspection reveals that the first, third, and fifth run SW to NE, but the second and fourth go NE-SW. Whichever way they go, they spell out SECOND TRACK THIRD BLONDIE ALBUM. It amused me to discover via Google that their second album is called “Parallel Lines,” which fits our theme pattern nicely, and then further that the third track is the famous “One Way or Another,” which is also our meta answer. So this was a cute idea, with both the album and song fitting in with the meta idea. Only 180 correct just before the bell, so this played tougher in general than it did for me specifically. And the grid is good considering how many diagonal words are running through it (these are notoriously difficult to construct). But I will lament again that the metas have been fun this year but we need a CHALLENGE, Pete! Bring it on! We can take it! 183 correct this month. Some experienced solvers definitely had a tougher time than you did! A slight red herring I found was that there’s the word BY going NW from the circled B, which caused me to parse the clue phrase as SECOND TRACK THIRD ALBUM BY BLONDIE or similar. But clearly that word isn’t parallel to the rest, and it requires rearranging the words to make a sensible clue phrase. Unfortunate, but it didn’t stop me from getting the answer. This has to be one of the most perfect procedure to answer matches I’ve ever seen in a meta. Nicely done, Pete! Keep in mind, there’s no circles on my grid, so I surely thought there was something going on here with this many pairs of this kind in the grid, maybe the non-capitalized letters from my examples would go together to form a message or something. I couldn’t really take it any farther than that, but it was fun for a while. There were also 4 sets of repeated clues (Demean, Saxophone types, King’s domains, and Tesla-clues). That didn’t go anywhere either. Pete mentions in his writeup that the circled letters were a potential red herring for Soprano, Alto, Tenor, and Bass. Harrumph, Pete, there’s more red herrings than that here! Nice puzzle, look forward to the next. Reiterate my question from earlier in the year about the lack of asterisk-ed clues as hints to the mega ….. am I again losing something in the print-translation? I always print the pdf version myself.